If I had to name one East Coast food I miss the most, it would be a good chowder. Chowder speaks New England to me. It speaks of summer with squeaky sandy beaches radiating heat and rainy days in a firelit pub, crowded fishing harbors with clanging boueys and circling seagulls, and the unmistakable smell of the ocean and seaweed suspended in fog. I moved away from New England 20 years ago, and still feel as though it’s in my bones – especially in the summer when I crave a clam or fish chowder. To satisfy this craving, I’ve learned to make my own. There is nothing more confirming that you are not-in-New-England-anymore, than when you order a “chowder” in different corners of the world that you call your new home. The results can be dismaying. So, long ago I decided to just figure it out myself. The fish has varied upon location. In Boston, of course, littleneck clams are the star ingredient. In France, I improvised with tiny vongoles, in England I dabbled with smoked cod, and in Denmark I relied on plentiful salmon. And now, in the Bay area, my favorite remains salmon. The buttery richness of salmon permeates the broth, adding a pleasant and necessary dimension to the creamy soup. For extra smokiness, I might add a little smoked salmon, but simple salmon will do. I’ve been making chowder for so long now, it’s become a staple in our menu rotation and my kids have grown up eating it, wherever we’ve lived. Heat oil in a pot over medium heat. Add onion and sauté until translucent, 2 minutes. Add flour and cook, stirring, another 2 minutes. Add water and whisk to blend the flour. Add the potatoes and cauliflower. Simmer, partially covered, until potatoes are tender, about 15 minutes. Stir in paprika, Tabasco, milk and cream. Bring to a boil, and reduce heat. Add salmon and simmer until fish is cooked through if using raw salmon, or heated through if salmon is pre-cooked. Stir in spinach and briefly cook until bright green in color and wilted, 1 minute. Season to taste with salt and pepper. Ladle into soup bowls and serve immediately. I love this – we eat salmon every week but I have never thought to put it into a chowder. Saving this for next week when the weather cools a bit. Kristy – if you don’t like cauliflower, than you can easily omit it! As a native New Englander who has also lived all over the world, I’m so glad to have this recipe. I always make my Grandmother’s potato chowder but can’t say I’ve ever made a fish chowder. Since soup season is now around the corner, I am so glad to have your recipe! I look forward to tasting it! 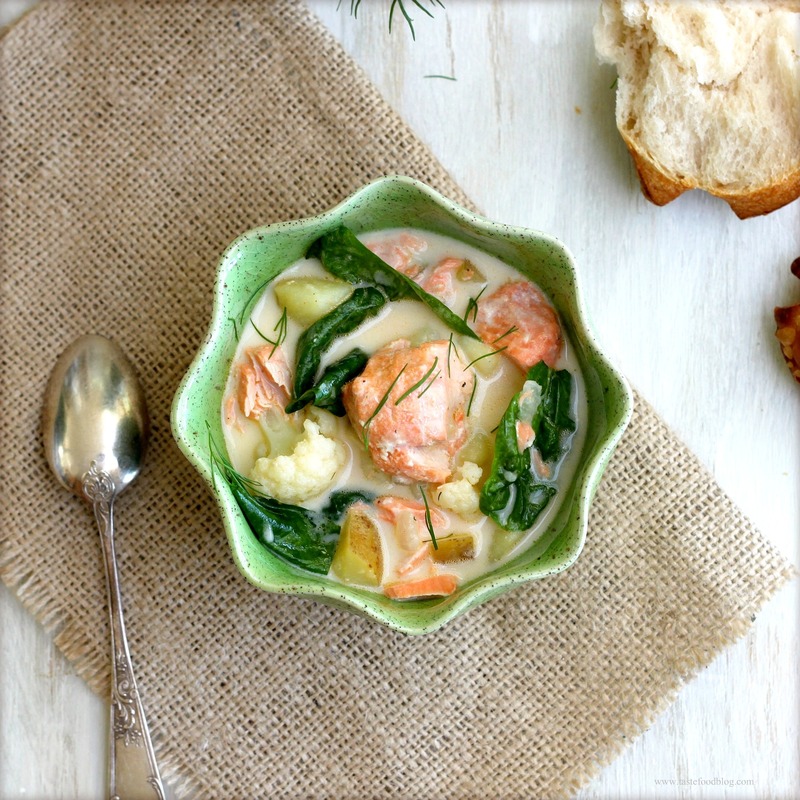 I love salmon chowder; and this is a great combination of veggies to use in it! looks beautiful and delicious. Love the pictures and the recipe, as always. Am on the East Coast now eating as much seafood as possible! What a wonderful new way to have salmon~delicious combination of foods! I never made chowder at home and looking at the bowl, i feel like grabbing some right now. It looks colorful too ! This looks simply wonderful. Great photos! Not sure I knew you were in the bay area. We must be neighbors! Looks delicious, love the presentation. Never tried salmon with cauliflower before but really looking forward to it. Love salmon chowder, haven’t made it in years though. This has definitely inspired me, right after I make Charles’ bouillabaisse! Photos have a lot of appetite appeal. I’ve never had salmon chowder! But love a good New England-style chowder. Can’t wait to give this a try! I will definitely go with this chowder as I love salmon and cauliflower. Love that healthy bowl of soup- fish & veggie combo sounds yum! I made this lovely chowder yesterday. I reduced some of the water and used one package of chopped frozen spinach. The broth was a little pinker than the picture. It tasted great! We had a little left over – we ate it today cold with a little balsamic/fig vinegar poured into it. WOW! Once many years ago I lived in the US and fell in love with chowder. I havent made it for some time but I recently went on a trip to cold country in Tasmania , Australia and saw one on the menu. As you say , results can often be dismaying when ordering a chowder outside of its home borders!! What delicate flavors! That chowder looks delicious. Pingback: Bag Items for September 14 & 15! This came up as gluten free…I substitute the all purpose flour for cornstarch. (1 1/2 tbs) You can omit the butter in this method, but the flavor is better with the butter. I also changed the milk to coconut milk and cream…and added tarragon, sage and rosemary. Also did this once with red curry paste added. In that version I also added Chinese mushrooms and red bell pepper. I love salmon, but have also swapped out shrimp.